The region’s natural environment is its distinguishing feature. Kilometres of ocean foreshore, coastal lakes, rivers, estuaries, lagoons, valleys and mountains have created corridors that have shaped the region’s development. The sector is worth around $880 million a year to the region and is growing.8 The Central Coast can leverage its natural assets and proximity to Sydney to generate more jobs and economic activity from tourism. The environment supports ecosystems which include protected species and communities. It also provides an attractive setting for people who live in the region, providing clean air, water and fresh food. The environment attracts investment, recreation, tourism and residential development. The region’s waterways and water resources underpin the health of the natural environment. They provide essential water to the community and drought contingency benefits for both the Central Coast and Hunter. The waterways also support water-based recreational activities including both powered and non-powered boating activities. Biodiversity corridors, including the North Wyong Shire Structure Plan Green Corridor and the Coastal Open Space System, provide habitat for plants and animals. These areas are part of a broader biodiversity corridor network that links to the Great Dividing Range, Hawkesbury River, Ku-ring-gai Chase National Park and Watagans National Park. They are also a part of a national wildlife corridor that extends from Victoria to Far North Queensland. Ongoing protection of the natural environment will allow more people to connect with and enjoy it. Extending the network of wildlife corridors will help safeguard the region’s environmental and scenic values. Productive lands in the west of the region provide a strong foundation for investment and will underpin growth in the economy. There are pre-conditions for increased agricultural production and ongoing resource extraction – they need to be separated from urban areas and have sufficient space to evolve and expand. Agribusiness is changing and trends suggest that productive lands will be used more intensively in the future. The region’s mineral and energy resources, including sand, sandstone, gravel, clay, hard rock and coal deposits, are valued at in excess of $180 million per annum.11 The continued development of these resources will support major infrastructure projects, industries and agricultural businesses. Collectively, these activities are generating employment across the region and supporting the construction industry. The region’s local quarries are cost-effective and provide a valuable resource for the construction industry both within the region and beyond. They border the M1 Pacific Motorway, allowing easy access to Sydney and global markets. This locational advantage presents an opportunity to grow related primary and secondary industries. Clustering these industries will drive higher productivity and establish a critical mass of economic activity in the region. Sea level rise, bushfires, flooding and coastal erosion are all potential threats to the natural environment and agriculture. Land use and infrastructure planning will need to respond to these risks. Cultural heritage is important to communities because it provides tangible connections to the past. Heritage items can also attract tourism which can contribute to local economies. Aboriginal people have a strong connection to the landscape and the region is fortunate to have a rich Aboriginal heritage. Conserving this heritage and respecting the Aboriginal community’s right to determine how it is identified and managed, will preserve some of the world’s longest-standing spiritual, historical, social and educational values. The region also has a rich non-Aboriginal heritage which includes numerous buildings and sites, including the World Heritage convict trail in the west of the region. The landscape of the Central Coast creates an important cultural identity for its community, with the region’s scenic amenity providing a dramatic backdrop and setting for development. New development needs to respect the scenic values and character of different places. Well-located new development can create new communities that also have a strong sense of identity and place. Heritage can add value to the character of a new development and should be considered in the planning process as a potential asset. It can give a development an added attraction or help establish a unique identity. 8.1 Protect the Central Coast’s scenic amenity by planning for development that respects the distinct qualities of different places. 8.2 Identify and protect heritage values to minimise the impact of urban growth and development, and to recognise its contribution to the character and landscape of the region. 8.3 Complete cultural landscape mapping and implement the findings through appropriate local planning controls. Agricultural lands are important to the Central Coast’s cultural and regional identity, the economy and tourism. They are concentrated west of the M1 Pacific Motorway, within the Central Coast plateaus and Yarramalong and Dooralong Valleys (see Figure 8). The region has to maintain a critical mass of agricultural industries and related supply chain, including ancillary services, infrastructure, markets, processing facilities and related industries. A review of agricultural lands in planning instruments is necessary to manage land use impacts on agricultural productivity and to secure the longer term future of this sector. This will be supported by regional mapping of Biophysical Strategic Agricultural Land, important agricultural land, infrastructure and key socio-economic indicators. The NSW Government has mapped Biophysical Strategic Agricultural Land which contains high quality soil and water resources. The NSW Government has also worked with councils and industry to develop methodologies for Important Agricultural Lands mapping. Mapping of agricultural industries will support their sustainable growth. Biosecurity will continue to be an important consideration for these areas as it contributes to the wellbeing and prosperity of the region and, more broadly, the nation. The NSW Government supports the development of rural areas that can adapt to changing agricultural trends and practices, while also accommodating agritourism and processing, packaging and associated retail services. 9.1 Identify important agricultural land that is suitable for agricultural enterprises and protect it from incompatible development. 9.2 Manage Biophysical Strategic Agricultural Land and other important agricultural land as locations for agricultural activities and complementary uses. 9.3 Facilitate the supply chain, including infrastructure, distribution, processing facilities, and research and development. 9.4 Protect the region’s wellbeing and prosperity through increased biosecurity measures. The Central Coast has State and regionally significant mineral and energy resources. Coal, petroleum and gas resources underlie large parts of the Central Coast, with the most viable opportunities located in the northern part of the region. These resources have potential to drive regional economic development by generating employment and supporting infrastructure, housing and other development needed for a growing population. The region is also an important supplier of resources for Sydney. Land use plans will respond to the lifecycle of the mineral and energy resource by adopting a staged approach that recognises the sequential nature of activities. Mineral and energy resources need to be managed and protected from incompatible development or encroachment that could prevent their ability to operate. There are competing uses for land in this region and there is a need to balance these interests in order to deliver the vision for this region. As part of the process to achieve balanced outcomes, the NSW Government has introduced a Strategic Release Framework for Coal and Petroleum. This is a mechanism to review and define which lands may constitute new exploration release areas. New exploration licences will only be issued in areas released by the Minister for Resources and Energy after an assessment of resource potential and economic, environmental and social factors. Community consultation and an upfront assessment of social, environmental and economic matters will occur through a preliminary regional issues assessment. This new framework is transparent, informed and consistent with the NSW Government’s broader mineral and energy resource strategies. 10.1 Plan for the ongoing productive use of lands with regionally significant construction material resources in locations with established infrastructure and resource accessibility. 10.2 Ensure that longer term extractive resources are not sterilised and minimise impacts on communities and the environment. 10.3 Ensure development in the north of the region takes account of the extraction of coal, clay and gravel resources. 10.4 Develop land use plans that respond to the lifecycle of mineral and energy resources to enable all stakeholders to better understand the long term productive value of the land and provide greater certainty for adjoining land uses. 10.5 Manage the ongoing use of mineral resources and provide access to up-to-date information about these resources through the NSW Government’s Common Ground website and its Geoscientific Data Warehouse. Potential conflict may occur if new housing encroaches into rural and resource areas, potentially leading to increased management costs or a reduced potential to sustain or grow rural and resource industries. Expanding rural and resource areas can affect established urban activities, if not managed appropriately. Land use planning can provide greater certainty for investment in these areas by establishing clear parameters and transparent processes for new development. The NSW Government will continue to engage with communities, interest groups and industry over land use conflicts. This will help with policy-making and initiatives to balance the economic, social and environmental needs of the community. 11.1 Identify and protect intensive agriculture clusters in local plans to avoid land use conflicts, particularly with residential and rural–residential expansion. 11.2 Encourage niche commercial, tourist and recreation activities that complement and promote a stronger agricultural sector, as well as build capacity to adapt to changing circumstances. 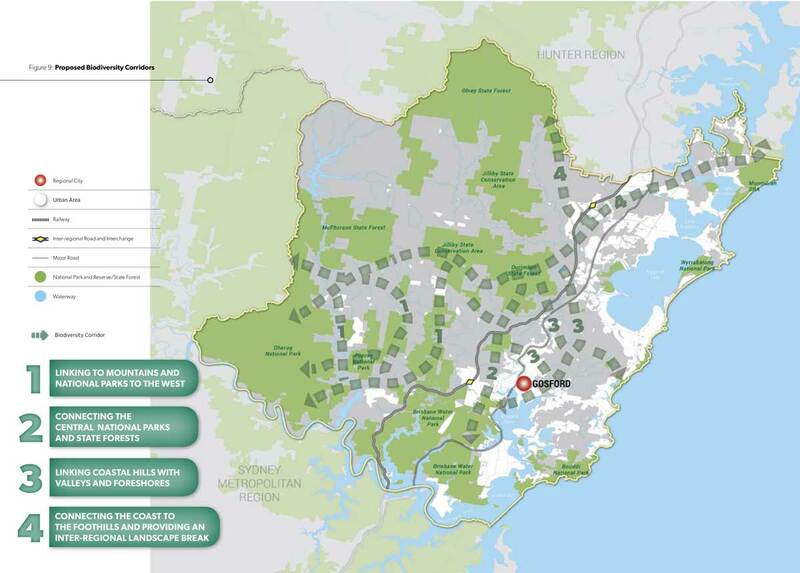 11.3 Address land use needs west of the M1 Pacific Motorway to provide integrated and adaptable outcomes for natural assets, productive lands and rural lifestyles. Many of the region’s natural features and environmental values are already protected through existing legislation. Protecting these values through planning strategies and local environmental plans will sustain the lifestyle, economic success and environmental health of the region. Using available data in strategic and land use planning will allow potential impacts on areas of high environmental value to be considered upfront at the strategic planning stage, rather than later at the development assessment stage. Land with high environmental value has been identified by the NSW Office of Environment and Heritage (see box below). The NSW Government is committed to ensuring the long term profitability and sustainability of forests and forestry industries. The region's forests provide tourism and recreational activities, habitat and wood products through harvesting, and environmental services such as good water quality, native habitat and connectivity with other forests (such as national parks). Across the region, natural areas provide a diversity of recreation opportunities. If sensitively managed, these areas will continue to provide important quality of life and tourism benefits for the region. 12.1 Identify terrestrial and aquatic biodiversity values and protect areas of high environmental value to sustain the lifestyle, economic success and environmental health of the region. 12.2 Identify and strengthen biodiversity corridors as places for priority biodiversity offsets. 12.3 Undertake a precinct approach to biodiversity offsetting in northern Wyong to protect riparian corridors and terrestrial and aquatic biodiversity and achieve the conservation, landscape and development objectives of the North Wyong Shire Structure Plan. 12.4 Strengthen the Coastal Open Space System by expanding its links and extending new corridors to balance growth in the north of the region and protect the network of natural areas across the region. 12.5 Sensitively manage natural areas on the fringe of the urban areas and in the west of the region to mitigate land use incompatibility issues and provide important quality of life and tourism benefits for the region. Biodiversity corridors are areas that link vegetation to form wildlife habitat. Corridors support ecological processes for plants (for example, pollination and seed dispersal) and wildlife movement (for example, for migration, feeding and breeding). They provide habitat and can improve the ability of species to adapt to changes in habitat and climate. Corridors also have significant scenic values and often support recreation. A holistic approach across both public and private lands will protect and manage natural ecosystems and ensure connectivity between habitats. Planning and management tools can identify and establish corridors; processes which sometimes takes many years. There are several areas on the Central Coast where large areas of remnant vegetation could be connected to form a network. These include national parks, State forests, council reserves, floodplains, foreshore and riparian vegetation. Tuggerah Lakes system, Brisbane Water, coastal lagoons, Lake Macquarie and the Hawkesbury River are important waterways and aquatic ecosystems. Surface and groundwater systems support ecosystems, industries and communities. They are also the chief source of the region’s urban water supply (see Drinking Water Catchment map above). Protecting water catchments and sustaining high quality and dependable water supplies is essential for the wellbeing of both the community and the environment. This has to be managed so that water is available for agriculture to support food production, and to meet the increasing demands of urban communities and industry. Linking the Central Coast water supply network to the Hunter Water network – the second largest in NSW, supplying more than half a million people – will increase the resilience of the two regions to future droughts. Water sharing plans form the basis of water sharing and water allocations in the Central Coast. Changes in water demand from different uses may result in the potential reallocation of water over time. 13.1 Protect water catchments to sustain high quality and dependable water supplies across the region. 13.2 Effectively manage surface and groundwater use in agricultural areas to support ecosystem function, food production and cater for the increasing demands of urban communities and industry. 13.3 Incorporate water sensitive design into development that is likely to have an adverse impact on coastal water catchments, water quality and flows. 13.4 Plan for the security of the region’s water supply. 13.5 Implement catchment-based plans for the ongoing sustainable management and health of estuaries in the region. 13.6 Apply neutral or beneficial water quality objectives to land use planning in surface and groundwater drinking catchments to minimise the effects of development on waterways including watercourses, wetlands, groundwater dependent ecosystems, riparian lands, estuaries, lakes, beaches and marine waters. 13.7 Plan new development to reduce the risk of introduction or spread of aquatic pests and diseases on fisheries and aquaculture industry practices. Most people on the Central Coast live near the coast, bushland or rivers. The appeal of these places is obvious, however they may also come with challenges such as flooding, coastal inundation, coastal erosion and bushfires. Climate change is likely to result in lower rainfall, higher temperatures and prolonged dry periods. This may cause more frequent hazards and of greater intensity. Coastal communities are likely to be more vulnerable to the threat of coastal recession and over the longer term, sea level rise. Tools have to be developed to manage the risk to communities, infrastructure and agricultural productivity from the impacts of climate change. Collaboration with the Mine Subsidence Board will assist in setting standards for development in mine subsidence districts. Land use planning that supports changes to the physical environment and infrastructure can help to avoid or manage risks and build community resilience to hazards. 14.1 Manage the risks of climate change and improve the region’s resilience to hazards such as flooding, coastal erosion, bushfire, mine subsidence and land contamination. 14.2 Review and update floodplain risk and coastal management programs to manage flood risk and protect the coast, particularly where urban growth is being investigated. 14.3 Incorporate new knowledge on regional climate projections and related cumulative impacts in local plans for new urban development.